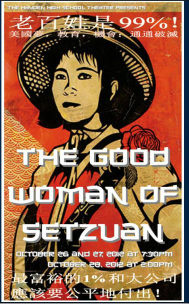 Brecht’s “The Good Woman of Setzuan” is a parable in which three gods come to earth in search of a good person. They are put up for the night by the prostitute Shen Te, and they reward her with a sum of money that enables her to purchase a small tobacco shop. Shen Te is immediately set upon by a collection of various victims and victimizers, all claiming a piece of her reward. She discovers that it is impossible to be both good and prosperous and creates an alter ego to help her keep her shop. The helper is her male cousin, Shui Ta, who ruthlessly manipulates the system in order to maintain Shen Te’s ownership of the shop. Eventually, Shen Te realizes that she cannot survive without Shui Ta, and he takes over her life. The play ends in a courtroom, where Shui Ta is accused of the disappearance of Shen Te, who finally reveals herself before the judges, who are the three gods. The gods bless Shen Te and encourage her to continue to be good. The play ends with their benediction as they return to heaven, leaving Shen Te to solve her dilemma on her own.